Listen! Did you hear that loud, harsh, rattling call down by the stream? One bird that is frequently heard, but not always seen at the refuge, is the Belted Kingfisher. The kingfisher’s loud rattling call generally precedes him as he scouts out his territory along the streams or canals of the refuge. 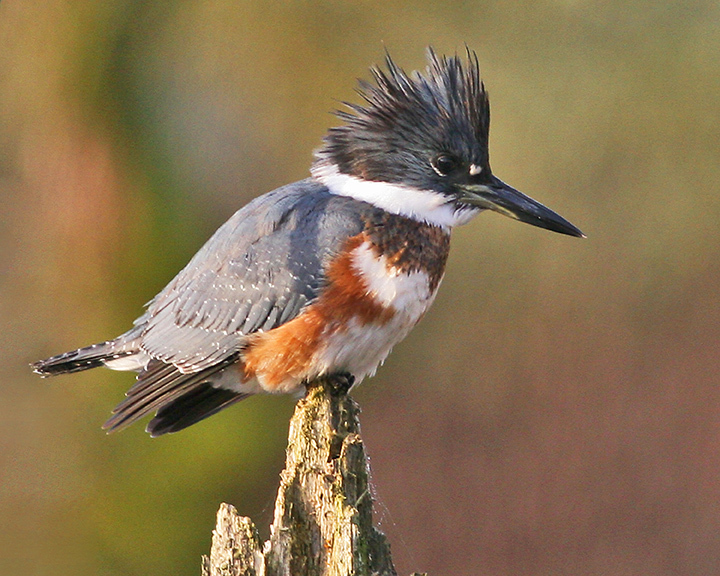 Did you know that the kingfisher has one of the more unique nests found in the refuge? It is in an underground burrow that is reached by a tunnel that can be up to 15’ long. The tunnel opening is generally found in the side of a sandy stream bank or cliff. Once hatched, the nestlings spend nearly three weeks in the total darkness of the burrow, being fed fish by their parents. And, it is both parents who are equally responsible for making their way down the long tunnel to where they regurgitate the fish they have caught for their nestlings. The nestlings begin to grow their feathers after the first week, but the feathers remain tightly enclosed within sheaths for almost two weeks. On the 18th day the sheaths split and the nestlings become almost fully feathered. Shortly after this, the nestlings make their way down the long tunnel, one by one, toward the bright sunshine. They spend little time fluttering around learning how to fly for when they get to the mouth of the tunnel their wings must work the first time they are tried as they take off from the lip of the tunnel for the tree tops around them. The parents, for the first few days, instruct their fledglings how to catch fish for themselves by dropping dead fish in the water for them to retrieve. After about 10 days they are able to fish independently and are driven by the parents from their home territory. As you drive around the River “S” Unit, listen for the raucous rattle of the kingfisher. Perhaps you will be able to see him flying along the stream or perching on a limb overlooking the water. 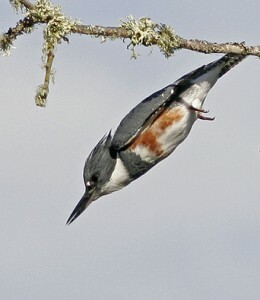 If you are very careful, you might be able to see him suddenly dive into the water and emerge with a fish in his beak. Keep watching and you might also be able to see him beat the fish to death on the limb and then toss it up in the air and swallow it head first. Some of the unusual birds seen at the River “S” over the last month include: Bonaparte’s Gull, Caspian Tern, Lesser Goldfinch, Semipalmated Sandpiper, Pectoral Sandpiper, Solitary Sandpiper, Baird’s Sandpiper, Spotted Sandpiper, Black-crowned Night-Heron, Green Heron, Semipalmated Plover, Yellow-breasted Chat, Peregrine Falcon, Red-shouldered Hawk, and Cooper’s Hawk. This entry was posted in Ramblings by admin. Bookmark the permalink.